I’ve been working out for years and consider myself advanced, will MAX Workouts be too basic for me? Not in the slightest! In fact, I have many advanced people (including professional athletes) on the program who constantly tell me how shocked they are at how intense and challenging the program is. It usually goes something like this, “Whoa Shin! I thought I was in great shape already, but boy was I wrong!”. MAX Workouts is based on full-body exercises that involve all of the fundamental movements that make you functionally strong and powerful. Even if you have experience working out, I have no doubt that the program will challenge you in ways you haven’t been challenged before. 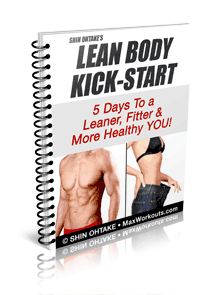 The workouts are completely scalable to your fitness level. In the book, I explain how you can increase (or decrease) the intensity level of each workout so you can progress at an advanced level.